Time outs have been a really effective form of toddler discipline for decades. Whether it be the more recent naughty step time out, or the age-old stand in a corner method; it can prove awesome for getting your little one to calm down and learn from their mistakes. However, as you may already know, getting your toddler to stay in a time out, and even getting them there in the first place, can be extremely difficult. There’s actually a lot of mistakes you can make when placing your toddler in a time out. 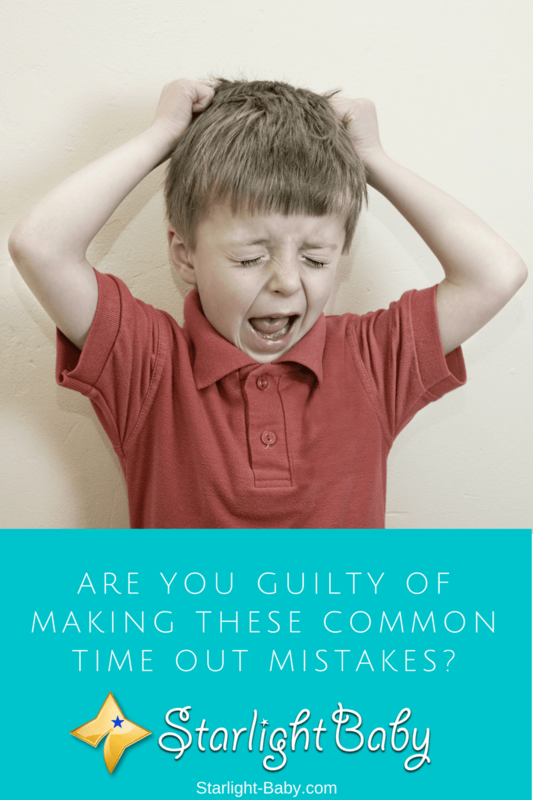 Here, we’ll look at the most common time out mistakes and how you can avoid them. Like any discipline technique, time outs aren’t going to work for all behavioral problems. There’s actually been research conducted by the Oklahoma State University, which discovered time outs best work with children who intentionally do the opposite of what you are saying. What they don’t tend to work for are whining and negotiations. For example, placing your toddler in a time out because they’re complaining about what’s for dinner isn’t going to prove very effective. If time outs are used for the wrong reasons, they can actually make the problem even worse. So, it’s imperative you only use them if your toddler is hitting you or their siblings, or intentionally being defiant. A similar mistake to the one above, time outs aren’t going to prove effective if they’re used too often. Your toddler will get used to going into a time out for a short period of time, knowing it will soon be over. If your toddler is repeatedly doing the same thing that landed them in a time out, it’s a sure sign that the time out isn’t working. The theory behind the time out is that the child will think about what they’ve done. Even older children aren’t going to think about what landed them in the time out, and it’s not possible for a toddler to truly understand and think about their actions. Instead, what the time out does is it stops the situation from becoming worse. It’s a chance for your toddler to calm down. It’s actually afterwards that they start to learn what they did wrong. So, always use time outs sparingly and for good reason. Also, don’t forget your toddler isn’t capable of sitting in a time out for long periods of time. They’ll get impatient and take themselves out of the time out. It’s said a child should be placed in a time out for one minute per year. So, if they’re two years old, the time out should last no longer than two minutes. Sometimes, it’s where the time out is located that’s the problem. If you make them go to their room for example, there could be plenty of distractions such as toys to play with. Your toddler isn’t just going to ignore those toys – they’re going to start playing with them. This means they’ll start to associate the time out as being quite fun and that’s unlikely to change their behavior. You need to ensure the time out area isn’t fun to be in. So, think about having it in the bathroom, hallway or stairs. Of course, you’ll also want to ensure the area is safe and your toddler won’t be able to hurt themselves on anything. If you’re giving your toddler a time out lesson, the last thing you should do is give them attention. It can be difficult to ignore them if they’re screaming or crying uncontrollably. However, as the time out sessions are generally quite short, ignoring them for this amount of time isn’t going to harm them. Toddler’s crave attention so when placed in a time out, there’s a large possibility they’ll start to do anything to get it. If you cave in and talk to them, or even shout at them, you’re going to make the time out ineffective. So, close your eyes, count to ten and take a few deep breaths whenever you feel the urge to respond to your toddler’s behavior. It’s the lack of attention which makes time outs so effective. As it is something your toddler craves, taking it away, even for just a very short time, shows them if they misbehave, they don’t get the thing they want the most. A very common problem parents have with the time out technique, is they struggle to get their toddler into the time out in the first place. They mistakenly get caught up in a power struggle, trying to force their toddler into the time out area. The trouble is, every single minute you waste in this power struggle, is delaying the punishment. A good technique is to simply ask your toddler to go into the time out area. Then, wait for roughly five seconds before issuing them with a warning. This should go something like “If you don’t go to your time out, you can’t have your favorite toy for the rest of the day”. Make sure you’re using an age-appropriate punishment here. If they still refuse, take the toy away. They will soon start to realize there are consequences for not going into time out. As tempting as it may be, avoid giving your toddler a lecture once they’ve come out of the time out. It’s also best to avoid saying things such as “I hope you have learnt your lesson now”. The time out is the punishment, so once that is over there shouldn’t be further discipline as it’s not going to have a positive effect. Instead, simply let them join back in with the family. There’s no need for further discipline as long as their behavior has improved. Time Out Still Not Working? Now, even following the above tips isn’t going to necessarily work. Time outs can be very effective, but as mentioned earlier, they don’t work for all types of behavior. So, if you’ve tried the time out technique and haven’t found it overly useful, it’s best to try other things. One alternative is to reinforce positive behavior. When you notice your toddler playing nicely and being kind, acknowledge and compliment them for it. As they do crave attention and approval, this kind of positive parenting does tend to work really well for toddlers who don’t respond to the time out method. You can also explain why a certain behavior was wrong after your toddler has calmed down. Trying to explain anything to your toddler while they are so hyped up and in the middle of a tantrum isn’t going to do anything. So, wait until they calm down and then explain why the behavior was wrong, such as not throwing toys because it’s dangerous to others. There are many ways to effectively discipline your toddler and the time out method is just one of them. Remember, if you’ve followed the advice above but the method still isn’t working, it could be an indication your toddler simply doesn’t respond to this form of discipline. Very well written blog! My son is 22 years old and my daughter is nearly seven months old. I needed this refresher article! Wow! Congratulations on your new baby, Angela. I’m sure it will be a new beginning for you because of the age gap but you can handle it, I know you would. Time out lesson is good when used effective and efficiently, but parents should be careful with how often they make use of time out discipline because toddlers and teenagers alike can be very incentive. Too much use of this time out lesson can be changed into an avenue by the toddler or teenager into using it in carrying out other schemes behind the parents back. You might be thinking that the child is grounded and in his room without knowing he or she has sneaked out through the window and off the property. Yes, that’s true. As they say, anything too much is not good. So yes, parents should be mindful when using time outs because a child may misunderstand it and render the attempt to discipline him/her into nothing. You can’t try excessive time out lesson with kids in my neighborhood because they would exploit it 100% to their own benefit instead of the parents achieving their aim of putting them on a time out lesson. That is so sad to hear, Martinsx. I hope someone does something to make things better ,otherwise, the kids in your neighborhood could become future “headaches”. My child is too young for verbal communication. Until he begins to speak, I will have to play by his rules. There will be no timeouts. However, when is little big, begins to understand verbal communication, I might have to use timeout techniques. I will remember these tips and make sure to avoid in the best possible way. There is time for everything. A baby who can’t even understand what a time out means won’t Learn anything from being put under such lessons. So therefore, it’s best to allow such child to come of age before bringing up such training lessons to the child. Yes, your child is still young to understand the meaning of time out. Wait a few more years, when he is already able to comprehend things. That way, he would better understand why you do what you do.